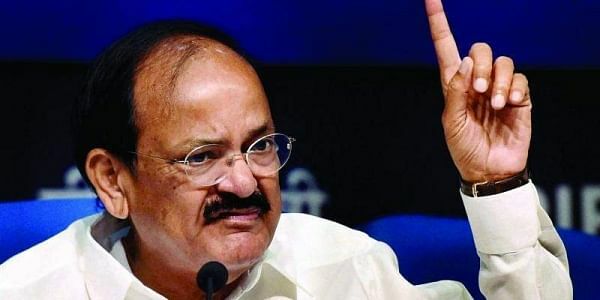 BHUBANESWAR: Vice President M Venkaiah Naidu on Saturday lashed out at the US state department for proposing a special fund to promote religious harmony and end discrimination in India. “I want to tell them that they need to take care of what is happening in America. They should look what is happening in their universities and restaurants. They should focus on their problems and spend the money to reform people in their own country,” he told at the 13th annual convocation of KIIT University. On Thursday, the US State Department’s Bureau of Democracy, Human Rights and Labour had announced the grant of $4,93,827 for organisations which can come up with ideas and projects to promote religious freedom in India. The Vice President said there are some isolated incidents here and there as India has a huge population. But action has always been taken. All of us should work together and see that the tendency is curbed. But we cannot accept and tolerate if somebody tries to preach us, he asserted. Stating that India has a great history, Naidu said, accessing, adopting, adapting and assimilation of new ideas has been the country’s strength. We must revive and adopt this inclusive and welcoming worldview. “We have not yet attacked any country and we do not even want war. Many countries, including smaller ones have ruled, ruined, looted and cheated us. Why? Because, we lost unity, we are not united, we forgot our culture. We have to remember the lessons, others need not teach us lessons,” he observed. Cautioning the students community for their over-dependence on search engines, Naidu said Google can never replace Guru. The country has advanced, there is an explosion of IT, and internet facilities are available everywhere, but one must understand Guru is always inspirational, he said. “Life is a continuos learning process. Everyone, including politicians must go on learning. Learn, learn and learn, not to simply earn, earn and earn. If you learn, you can earn. If you have Maa Saraswati, you can have Maa Laxmi. There is no guarantee to get Saraswati if you have Laxmi,” he maintained. Taking potshots on those who prefer English than their mother tongue, the Vice President said all should remember four things - mother (who has given birth), mother tongue (which has come out of mother’s womb), motherland (where you are born) and Guru (who has given you education and knowledge). “Learning new skills and acquiring new knowledge is vital in today’s knowledge economy. Upgrading our competence, updating our knowledge and adapting to a rapidly changing work environment is the need of the hour. We are in an era of LPG - Liberalisation, Privatisation and Globalisation. Unless you earn skill and upgrade it, you will not be able to face competitions,” he added. Speaking at the event, Governor SC Jamir advised the students to be persistent and accommodating. Have lofty aspirations, be dedicated to education and learning and remember that endurance, optimism and perseverance are what one needs in future to excel, he said. As many as 4,820 students received degrees, of which 3,678 students received Bachelors, 837 received Masters, 240 received Dual Degree and 62 received their PhD Degree. Padma Vibhushan Raghunath Mohapatra, Chairman Emeritus of Simplex Infrastructure Pvt Ltd Bithal Das Mundhra and Chairman of Bharatia Charitable Trust Kishanlal Agarwal were conferred with Honoris Causa Degree. Among others, interim Chancellor of the university Subrat Kumar Acharya and Vice Chancellor Hrushikesha Mohanty also spoke.